Choosing the color is one of the most important parts of buying your new smartphone and it can be a tough decision. We've put together a guide so you can see every shade in one place. If you're planning on picking up the newly launched Google Pixel 2 or Google Pixel 2 XL, you'll have a few different color choices for the new devices. Below we've listed all of the colors we've seen for both the Pixel 2 and Pixel 2 XL, but we don't currently know if certain markets will have limited color choices at launch. The colors are different for both the Pixel 2 and Pixel 2 XL too, so make sure you're clear on what version of the phone you want to buy. Yeah, the name of this one kind of sums it up. The darkest version of the Pixel 2 comes with two slightly different shades of black, but it's not as bold as the other options for both of the phones. This is by far the darkest shade, and you'll be able to buy both the Pixel 2 and Pixel 2 XL in this color. This is the only version of the Pixel 2 that comes in a different shade to either black or white. Kinda Blue is a little muted compared to most other blue phones on the market right now, but it still looks like an attractive handset and you'll only be able to get this shade on the Pixel 2, and not the Pixel 2 XL. If you're looking for the lightest shade of the Pixel 2, this is it. The clearly sarcastic name refers to how plain the phone looks, but if you're looking for an indistinct color this could be a great choice. 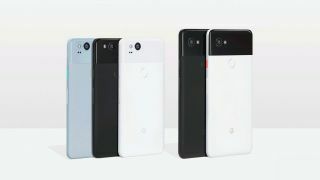 Clearly White is only available on the Pixel 2 and won't be a color choice for the Pixel 2 XL. This is perhaps the most contrasting look for the phone and is exclusive to the XL version of the Pixel 2. The top part is a deep black, much like the top half of the Just Black version, while the bottom is a clean white shade. It looks to be one of the boldest color choices on the market for any phone right now, but it's an attractive look.